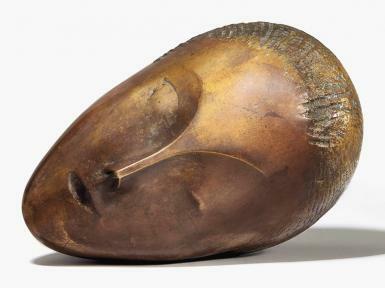 A bronze sculpture by the Modernist artist Constantin Brancusi has sold for the record-smashing price of $57.37 million in New York on Monday. This is the highest price achieved for the Romanian-born sculptor and more than twice the pre-sale estimate. The artwork depicting a woman’s head titled “La muse endormie” sold after nine minutes of sometimes frantic bidding at Christie’s impressionist and modern art sale in New York. Created in 1913 the bronze, a casting by an artist lived in Paris, was bought by an anonymous bidder appearing in the catalogue for $25-35 million. La muse Endormie counts among the most important achievements in the dawn of a new sculptural language. It is an intense purification of form and emotional resonance. First conceived in marble in 1909-1910, La muse endormie was cast by Brancusi in six bronze versions by 1913. Four bronzes today are housed in museums—The Metropolitan Museum of Art in New York, The Art Institute of Chicago, and two examples in the Musée National d’Art Moderne, Centre Georges Pompidou in Paris.